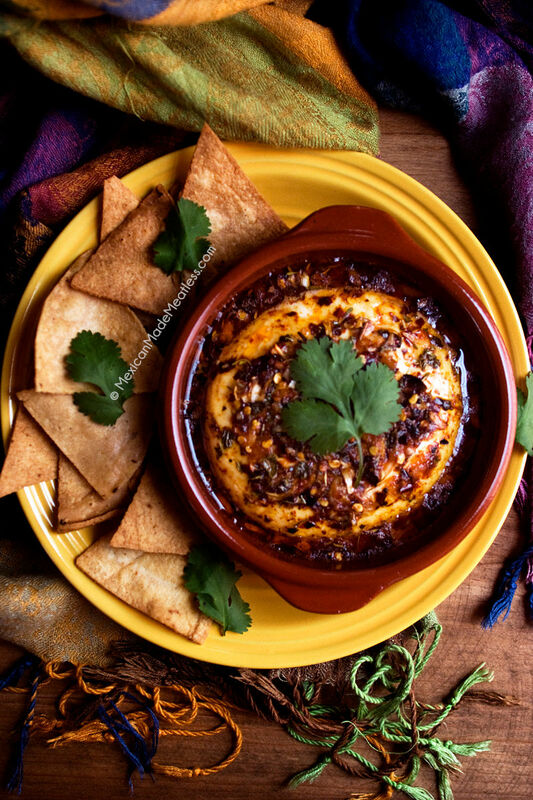 Light and creamy Mexican panela cheese is marinated with lots of herbs and spices to created this fabulous appetizer, you’ll never want to taste another! It’s perfect for a party or to indulge with a glass of red wine. Have you ever cooked something that just surprised you with how utterly scrumptious it was? This was the case when I prepared this cheese. I love cheese so much, and as pleasant as it is to sit down to eat a serving French style (as in un plateau de fromages) I love eating it all sorts of ways. 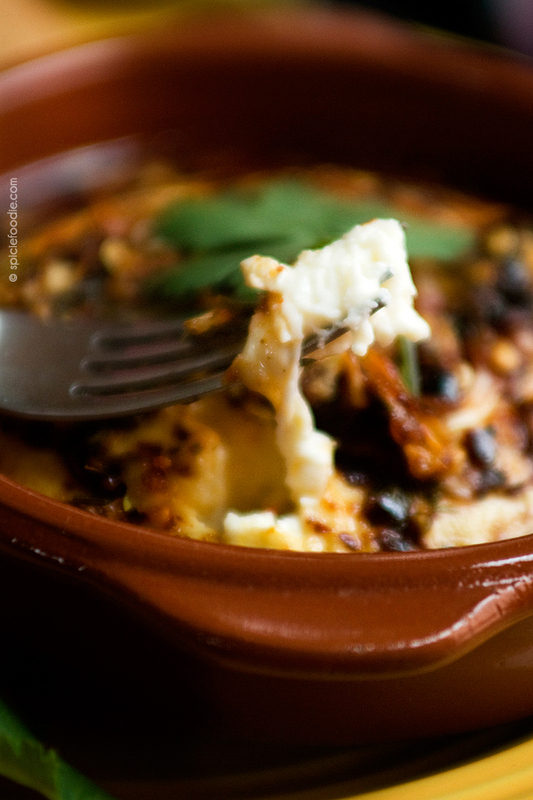 Baked cheese can be such a fun and delicious experience, wouldn’t you agree? Panela cheese is a Mexican firm, fresh cheese that is fantastic for baking, grilling, and frying. You can find it in the Latin food section of most grocery stores. If not you can look for queso blanco, queso fresco, or in a pinch even use feta — really any fresh cheese that doesn’t melt but only softens when heated. The first time I came across a recipe for baked panela cheese was in one of my favourite fiction novels “The Secret Book of Frida Kahlo“ by F. G. Haghenbeck. The recipe is an actual one written and cooked by Frida Khalo — isn’t that cool! It was absolutely delicious, but I started playing with the recipe and it evolved into the herby and spiced version I am sharing with you today. The first time I prepared this baked cheese for my husband he declared it to be “one of the very BEST foods I have ever cooked!” And still to this day he repeats the same thing. I love him! I will also have to agree on how amazingly delectable this baked cheese is. If it wasn’t such an indulgent dish I would prepare it more often, that’s okay because it’s a great treat for us when we do eat it. It’s great to enjoy alongside some wine, as an appetiser, and it would be excellent at your Christmas and New Years parties. 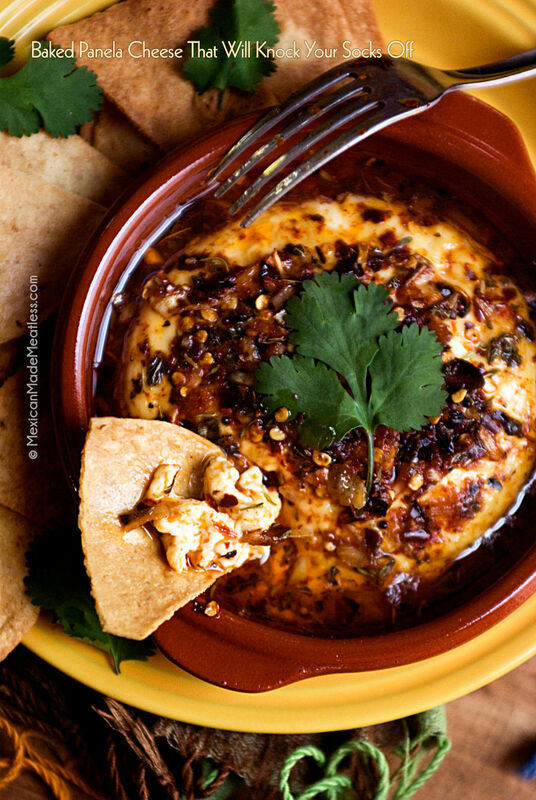 Light and creamy Mexican panela cheese is marinated with lots of herbs and spices to created this fabulous appetizer, you'll never want to taste another! Drain the cheese and set aside. In a bowl combine the oil and all of the herbs and spices. Poke little holes all around the cheese to help the seasoning absorb better. Place the cheese in with the oil and spices mixture and coat the cheese, cover with plastic wrap and allow to marinate in the refrigerator for at least one hour or overnight if desired. * If you'd like you can use dry,granulated garlic and dried onion instead of fresh. The taste is still delicious and when I have both I use them. ** If you're not huge on herbs go with the lower measurements or adjust amounts to your taste. I’ve always thought that panela cheese gets a bad rap. Rather than bland, I like to think of it as a bland palette that I can dress up any number of ways. This recipe is a great way to use this versatile and low-fat cheese. I use it as a substitute for haloumi (a Cypriot cheese that I absolutely adore), as I can’t buy haloumi where I live. I like to grill it and add to salads! Spiced up, of course! Thanks, Nancy. Am so enjoying your about.com articles–you are doing a terrific job. Thanks so much for the great feedback. It’s been so much fun writing those articles too. Cuidate mucho! This looks so inviting and totally irresistible! It is very irresistible 🙂 Thanks Angie! Thank you John, I hope you give it a try sometime! i have never had baked cheese before! it looks wonderful. This is an very interesting yum looking dish, I might have to try it out this break. You’re right, it’s perfect for New Years Eve! This is so much better than the spinach artichoke dip that I tend to fall back on. WOW! This looks freakin Awesome Nancy!!! My socks flew off just looking at the pictures. I’ve sent you an email response. Thank you! I am trying to find the baked panela recipe. Every where I go I will not come up. Could you please tell me how to access it. Sorry for the inconvenience, the recipe and brand new video are here now. Enjoy! HI, I can’t find the baked Panela recipie, the link may be broken. Can you share it with me please. It looks delicious. Please check the email you used for this comment, I’ve sent you the recipe. It will coming from my email address spiciefoodie @ gmail, Thank you! 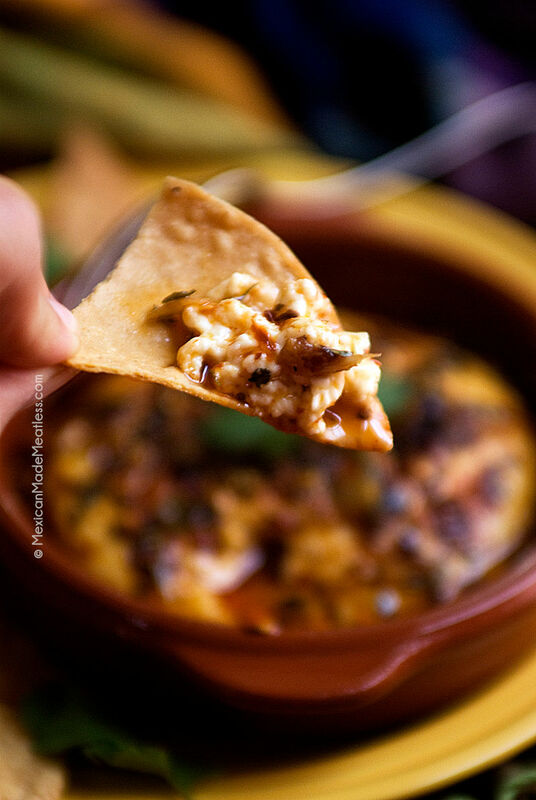 The Baked Panela Cheese looks delicious. Could you please send me a direct link to the recipe? I am unable to locate it by clicking on the link above. Hi Deb, Sorry about that the video and recipe are now above. Thanks! Sorry about that, you can find the recipe above now! Thanks. You mentioned using a “small” cazuela dish for this. What would be the exact diameter? I see that there are 4.5 inch and 6.5 inch available. Thank you! The exact cazuela size really depends on the diameter of the panela cheese that you can get locally. My small cazuela is nearly 5 inches. So my advice would be to measure the cheese first then purchase your cazuela. Thanks! This was disappointing. The cheese never softened, no matter how long I baked it. In the video, I see some melty stringiness, that I couldn’t reproduce. The recipe does state that this type of cheese is not a melting one. Different brands of panela cheese will give different levels of “stringiness”, mine may have had more liquid and fat than the brand you used. I’ve bought brands that were even more stringy than the one in the videos and others that hardly changed in consistency. Thank you!